When the word “chandelier” is uttered, most people immediately envision a large, ornate hanging light fixture that is made out of crystal and is expensive. They think of one in a palace or mansion and that a chandelier wouldn’t fit in their home. Invented for the express purpose of holding candles, chandeliers have evolved over the centuries and are appropriate for all homes. These light fixtures are beautiful, elegant, and functional. Brilliant Homes Lighting Gallery with showrooms in Eugene and Salem will offer up tips on how to pick a chandelier. Contact us today for all your lighting needs! Decide on style. Chandeliers today come in any shape, size, design, and material you can think of. From modern, contemporary, and transitional styles with a whole array of dimming options and light output features, deciding what style you want will help narrow your focus. Size. You’ll want your chandelier to fit with your dining room lighting, hallway lighting, or entry lighting. Too big, and the chandelier will overwhelm the room. Too small, and it’ll seem out of place. 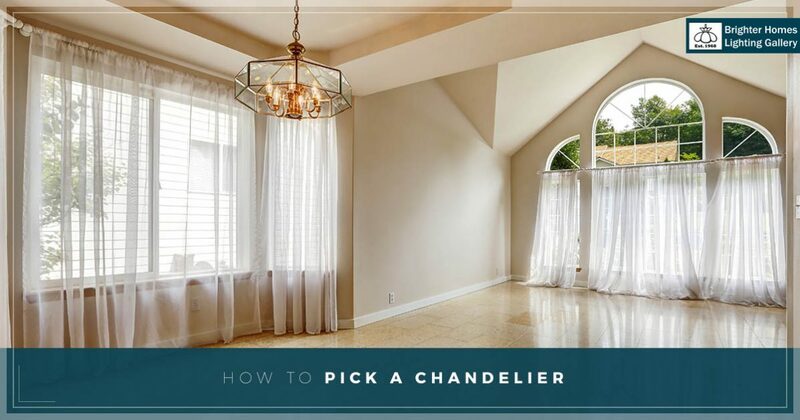 A rule of thumb to follow is to measure the length and width of the room for your chandelier and add those two numbers together, which should be the diameter of your chandelier in inches. Simple or ornate? If you want the chandelier to be the center point of your dining room lighting, then ornate and elaborate would be your best bet. If your chandelier is for living room lighting, it might be best to be simple in design so it won’t detract from the TV for example. Dimming options. Most people like dimming options in lighting, which can set moods and complement the natural light in the room. Chandeliers come in LED lighting, and most of these are fully dimmable. Functionality. Chandeliers are meant to be accent pieces, to highlight the decor of your room and add style and beauty. Do not expect your chandelier to be the primary source of living room lighting or dining room lighting. Lights in the center of the room for primary lighting is not the best idea overall. Incorporating recessed lighting, cove lighting, or wall sconces in a room along with your beautiful chandelier are great lighting ideas to really highlight pictures, paintings, or countertops. Chandeliers are still required ornaments for the rich and famous, chandeliers can accent any room and be a shining source of beauty for years to come. Brighter Homes Lighting Gallery in Eugene and Salem, Oregon, specialize in indoor and outdoor lighting for your home or business. From ceiling lights, chandeliers, wall lighting, and ceiling fans and lamps, we have the right lighting for your space. Whether you’re looking for the perfect lamp for your child’s bedroom or lighting for the long summer nights on your patio, Brighter Homes Lighting Gallery can help you choose the right lighting design. You can shop online, visit one of our showrooms, or book and appointment with a lighting expert who can show you all your lighting options and help with choosing the right lighting for your needs. We’re here to help make your home bright. Contact us today!